Here wizards, magicians, sorcerers and everybody can rest a bit and talk about anything they like. Just remember to respect the rules. Whatever, it touches me. Like the composition, ......... and cats. I really like how clean it is, and it suits that wallpaper which is great in it's own right. I sadly cluter mine up with temp readings, HDD usages, folder views etc. etc. Did you draw that yourself? Gosh no!....I think I got it from Wikipedia. (its a google art project inclusion) Still Life with Cat and Onions by Boris Grigoriev. Cute isn't it? I was playing around with wallpapers to enter in the contest but never entered them. This one was made from a world map at Wikipedia that didn't have license restrictions and changed to use Mageia colors. 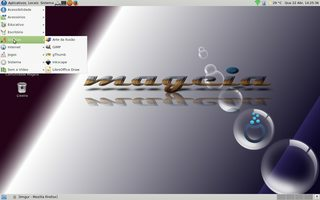 I was trying to reflect the "Worldwide" use of Mageia and only made it in 1920x1080. I keep my desktop pretty simple unless I clutter it up with temporary text files that I use for info I just want to keep for a bit then delete or file it away, then they're moved into the files folder on the desktop. I did make a few other wallpapers and some of them may be better for some people. After using this one for an hour I kept it and have been using it for a few months. I can share it if you'd like to have it, I just haven't taken the time. I might be having back surgery if they think it'll help and that has slowed me down a lot. I just uploaded them and they were just ideas but someone may like them. I kind of liked the bubble one too. It all started when I bought a great book on GIMP. The cauldron with the icons for bubbles isn't anywhere near done. It is kind of like a scribble to get an idea written down. There are 10 types of people, those who understand binary & those who don't. and number three: i like your Mageian inspiration. Thanks for the additional information concerning licensing. Meanwhile i made it my standard wallpaper, really my taste, thanks once more. A totally different background, one for me, somewhat scary. But very nicely setting, keep on going!!!!! Weather from Yahoo Weather, new updates checks with urpmq --auto-select --update. That Mageia cauldron ASCII graphic in the left terminal, is that from screenfetch ? doktor5000, yes. That is from screenfetch. BTW, this is not about a complete desktop but I just learned today that quite a lot of terminals provide truecolor support. doktor5000 wrote: BTW, this is not about a complete desktop but I just learned today that quite a lot of terminals provide truecolor support. Look great. If libcaca use ncurses & s-lang then it's possible to create beautiful colored console apps for direct using framebuffer with this lib for systems without X-server (or without access to X-server). Very interesting.